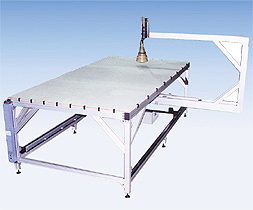 The X and Y travel use belt driven positioning tables. Travel is 30 feet (9 meters) by 9 feet(3 meters). The Z axis is ball screw driven with 8 inches (200 mm) of travel. The steel surface plate is mounted to a flexible aluminum structure. Servo motors are mounted to each of the linear slides and are used to control the movements of the entire system.